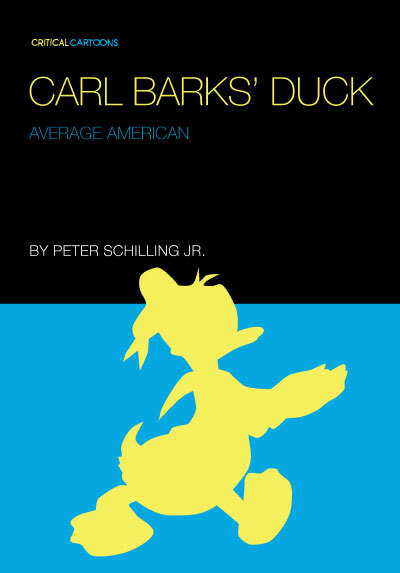 In last week’s post I mentioned I’d write more about Carl Barks’ Duck by Peter Schilling Jr. (out now from Uncivilized Books). Well, I ended up writing about the Critical Cartoons series as a whole. 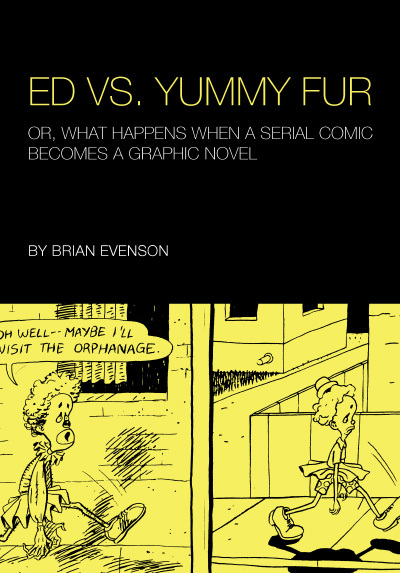 The first book (Ed vs. Yummy Fur: Or, What Happens When A Serial Comic Becomes a Graphic Novel by Brian Evenson) took on a key (and under appreciated) work from the comics underground: Yummy Fur by Chester Brown. Yummy Fur is scatological, sacrilegious and challenging. It was a way for Chester Brown to break down not only his inhibitions and beliefs, but also his approach to making comics. To date, Yummy Fur has not been reprinted. The only part of Yummy Fur still in print is the collected (and heavily edited) Ed The Happy Clown. In other words, this a relatively obscure work that for all it’s influence, has been partially forgotten, and difficult to track down. Yummy Fur and comics like it represent one side of the spectrum of the comics continuum. The lost and forgotten self-published work, the minor masterpieces, hidden gems, significant early work (or ‘unusual’ late work) of great cartoonists… published by obscure small presses. I would be very happy if the Critical Cartoon series manages to bring some of them out into the light. The second book, Carl Barks’ Duck, looks at Carl Barks’ Donald Duck stories. Barks’ Donald Duck could not be more different from Chester’s work. First, it’s a corporate product. Second, all the characters and situations are owned wholesale by the Disney corporation. Finally, it was a way for Disney to maintain copyright on Donald when his primary medium, the cartoon, had waned in popularity. And yet Barks’ created an amazing array of stories and characters within that system. His contribution to comics is difficult to measure. He is one of the greats. 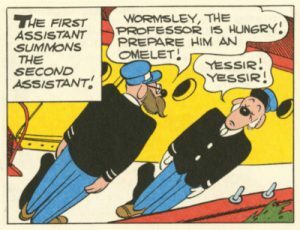 His work has been almost continuously published around the globe and has influenced comics and cartooning everywhere (for example, Osamu Tezuka was hugely influenced by Barks’ work). Barks’ work represents the other side of the comics continuum: the corporate mainstream. Some, like Barks’ comics, are well documented, examined and easily available. Others were very popular in their time, but have become lost, or—if they are still currently published—changed beyond recognition (for example Captain Marvel / Shazam). Or, there are the occasional moments in time (1985-1987) where artistic experimentation, audience expectations, and corporate willingness to take chances, results in a deluge of interesting work in the mainstream. Some of this work (Dark Knight or Watchmen) goes on to influence and create whole new movements. Other comics (The Shadow or The Question) languish in relative obscurity. This is where many comics readers start. When I was younger (I grew up in Europe), I immersed myself in Marvel and DC universes, or the fantasy / science-fictional worlds of Thorgal, Valerian and Funky Koval… Or, in the humor of Lucky Luke, Asterix and Kajko i Kokosz. 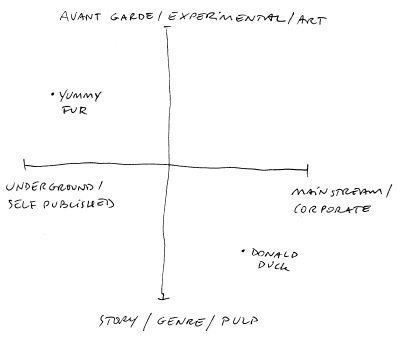 Eventually I went on to discover (and create) comics closer to Yummy Fur in their sensibility. But this is where I started. There is a lot of interesting work at this end of the spectrum. For some reason I never got into the Disney comics, and consequently I didn’t encounter the work of Carl Barks until I was much older. Eventually, I became aware of his work, but it was always difficult to know where to start. Barks is such a ubiquitous cartoonist – so beloved and so prolific – that it’s difficult to know where to start… especially for new readers. Should I read the best works? What are the best works? Are they really the best works? Should I try to read from the beginning? I approached Peter Schilling Jr. about writing something for Critical Cartoons, I was selfishly delighted when he chose Barks’ Donald Duck comics. Peter went on to write the perfect introduction to the work… and with Fantagraphics’ recent push to reprint all of Barks’ Duck comics, now is a perfect time to examine his work again. Another goal for Critical Cartoons is to bring new voices to comics criticism. Both of the authors (Evenson & Schilling Jr.) are big fans of comics, but in their careers have never had the opportunity to write about them. If given an opportunity, something interesting might emerge. Starting with tiny detail — a dash placed between ‘graphic’ and ‘novel’ to form ‘graphic-novel’ (read this excerpt on TCJ) which subtitled the recent Ed the Happy Clown re-issue, — Brian’s close reading of minutiae in Brown’s work was revelatory. More importantly, his unapologetic placement of Brown’s work in the continuum of sacrilegious and scatological works that goes back centuries, points to ways of reading comics that engage with broader culture. Peter’s comparison of Bark’s Donald Duck to the classic Hollywood system was revealing. Hollywood Stars, for example Cary Grant or Jimmy Stewart, took on a variety of roles, but often remained distinct recognizable characters themselves. Donald fits that bill too (sorry)! Finally, look at this flabbergasting ‘weird’ panel (see below) from Lost in the Andes. It’s such an usual angle and I certainly haven’t seen Barks use it again elsewhere (at least in my limited familiarity with his work). Did he try it out, decide it wasn’t working, and never used that angle again? Barks scholars… any insights? Now that the two inaugural volumes of Critical Cartoons are out, it’s time to look forward to next volumes. There are a few new Critical Cartoons project bubbling up. I’ll keep you posted as they develop. Thanks for reading! Soon: Progress report on Trans Terra: Towards a Cartoon Philosophy!